On a previous article, we discussed how to add authorization to the routes for an AngularJS SPA app. Our previous solution just stops the route change cycle by raising an error which is visible on the browser console. Since this is really not user friendly and provides no feedback to the user, we want to be able to instead redirect the user and display a better message. In order to improve the user experience, we need to add another route on our application which can be used to show a view with a better description of the not authorized error. If we look at our previous specifications, we notice that there are only two specified routes. We can now add a third one which we can use to redirect the user. The specification now shows three routes. The /login route has public access, as it is needed to allow the users to login to the app. The /claims route requires the app.about claim to be present in the user security context. This is route that we validate against our claims. We also have the /noaccess route which is used to redirect users when the authorization validation fails. We should notice the redirectTo attribute on the claims route. This is used to indicate which route to use in case we need to redirect the user. Since we now have the /noaccess route, we also define the view information that our app needs to load and the corresponding HTML for that view. We continue to raise the error to terminate the route change thus preventing the user from seeing the unauthorized view. Since this error is raised on the route resolve event, we could now catch it on our app.run function. When a route changes successfully or fails, the route provider raises events that can be handled during the app.run cycle. In our example, we are interested in handling the $routeChangeError as this event is raised when we terminate the route. Our app can listen to that event by implementing a new function and associating to the app.run block in which we can inject the $rootScope and $location service. The $rootScope listens to the events, and $location is used to navigate to a different area of the app. Now that we have our new implementation, we can see it in action below. To test if this is working, we can delete the app.claims claim from the /claims route by visiting the claims view and clicking on the trash can icon. We can then navigate back to home (menu) and try to click on the claims menu link again. Since the claim is removed, we should now be redirected to the noaccess view which displays a better message. I hope this is able to provide you with additional ideas on how to implement authorization on your apps. Continue to follow for other authorization entries. When we talk about routing with AngularJS, we make reference to a service that allows us to map URL routes to view templates (HTML) and controllers. This is what allows a single page application to navigate to different areas of the app. In the context of authorization, we need to allow access to protected routes/views to only the users with the corresponding claims or access. This is even if the user attempts to force load the route by typing the URL or running a command on the browser console. The claims and requiredAuth attributes are used to check if the route should be protected, and if so, what claim should be used to validate for the access. We look at this in more detail on our route implementation later on. We have defined the $appRoutes JSON which contains the application route definition with view, controller and claim association. This has the necessary information to wire our routes. For now, our current implementation just handles the routing to different areas of the app. There is no restriction on the access. We can implement the security/authorization next. For authorization, we rely on an authorization service which sets the user context with the corresponding claims. For now, we just simply set the claims with the service as a property. For a production app, there should be integration with an identity provider. During the app configuration phase, we can inject the authorization service ($svcAuth) to the route configuration. We add the security validation to the routeProvider resolve function which waits for a promise to resolve successfully before the route changes. This allows us to verify the access before the route changes and presents the view to the user. In cases when the required claim does not exist in the user context, we terminate the route change by throwing an error. Otherwise, we resolve the call to true which allows the route to change successfully. We can now take a look at our complete implementation with the authorization enhancements. For this implementation, the auth service is used by the configuration phase of the application. When configuring our routes, we use the auth service to validate the user claims during the route resolve call. 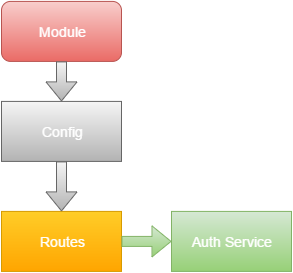 The auth service can also be used with other components like directives and controllers. To test if this is working, we can delete the app.claims claim from the /claims route by visiting the claims view and clicking on the trash can icon. We can then navigate back to home (menu) and try to click on the claims menu link again. Since the claim is removed, we should get an error which can be seen on the browser console, and the app would no longer navigate to the claims view. We should notice that during the resolve route process, we raised an error to terminate the route. This is not really an elegant way to signal to the user that he/she has no access to that area of the application. We could do better by redirecting the user to an area of the application that can provide a detail message. We should also notice that we are displaying the navigation menus without any security validation. Since we know the user context, we could secure our navigation menu and avoid unauthorized clicks on the app. This would be a much better user experience and additional layer of authorization. Hope this help us in protecting our routes. This error is usually a result of an add-in prefix update on the farm. When we configure the on-premises development environment for SharePoint add-ins, we need to provide a prefix to our apps. This prefix is used as a subdomain name for the app. App subdomain name. app is the add-in prefix that was configured on the farm. This is the command to update the add-in prefix (SharePoint Management Shell). Notice the word “app”. This is the prefix. These are the commands to re-start the service (stop/start). Run this command from the windows command shell (use Run as Administrator). Provided that there are no errors, we should be able to go back to Visual Studio and deploy the app.